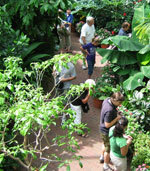 Join us for informative, casual, and fun outdoor gardens and conservatory walks. 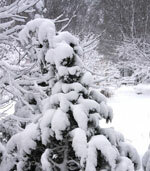 Walks occur snow, rain or shine; cancellations only in the event of dangerous lightning or snow storm. Dress appropriately for the weather. All walks begin in the Visitor Center Lobby. Limited space; register early and by the deadline. Indicates an adult program that accepts youth participants. 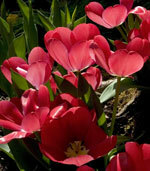 Enjoy a lively spring garden walk to get motivated for the growing season! This outdoor garden walk addresses common questions related to spring pruning, perennial clean-up and division, soil preparation, and mulching. Includes demonstration of techniques, tips, and tools to save you time and effort. 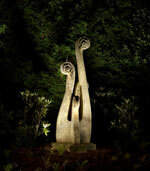 Tuesday,	April 9,	5:30-7 p.m.
Olbrich's outdoor gardens include a collection of fine art sculptures integrated into the landscape design. Stroll through the gardens and explore these works of art as you hear about the inspiration behind them, and the artists and techniques used to create them. Tuesday,	April 23,	6-7:30 p.m. Discover some of the incredible tropical trees, palms, ferns, and flowering plants in the Bolz Conservatory collection. See more than 650 plants up close, and hear about some of the unique adaptations and uses of plants from tropical and sub-tropical environments around the world. Saturday,	April 27,	4-5:30 p.m. 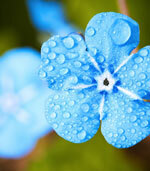 Shake off those winter blues and experience Olbrich's spring meadows in bloom! Stroll through the various gardens as you learn about the different bulbs coming into bloom and how to plant and care for them in your own garden. Tuesday,	April 30,	5:30-7 p.m. Flowers too pretty to eat? No way! Enjoy the wonderful world of edible flowers one petal at a time. During this exclusive walk in the outdoor gardens, learn about spring-blooming edible plants, try some flowers and recipe samples, and take recipes to try at home. Tuesday,	May 7,	9-10:30 a.m.
After a long winter, planters filled with cold-hardy colorful flowers and foliage are a welcome sight! During this evening walk, see creative container plant combinations and hear about the basics of planning and planting cold-hardy spring containers. Tuesday,	May 21,	6:30-8 p.m.
Olbrich's Wildflower Garden puts on a spectacular spring show every year! We will look for bloodroot, trilliums, Virginia bluebells, Jack-in-the-pulpit, and other early bloomers, and might spot a lady's slipper. Plants and ideas to extend the season of interest for your woodland garden throughout the entire year will be discussed. Wednesday,	May 22,	6:30-8 p.m. Whether you are trying new ways to enjoy physical activity, restore balance to your life, improve stress management or eat healthier, Olbrich Botanical Gardens can support you on your journey to better health. Round out your wellness practices with our diverse adult classes led by experts in their fields. Limited space; register early and by the deadline. 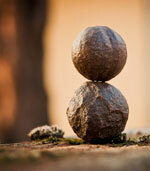 Emphasis is given to aligning breath and movement, slowing down and paying attention, and relaxing into your own body. All abilities welcome. Register for one or more 8-week classes as a series. Mondays,	February 4-March 25, 5-6 p.m.
Mondays,	April 1-May 20,	5-6 p.m.
"Move like a great river; sit like a mountain" - and so the centuries-old description of the physical and meditative practice of Tai Chi instructs the seeking student. This class offers standing, moving, and seated practices rooted within the Chinese tradition of Tai Chi Ch'uan and the beauty of Olbrich's gardens for the enrichment and wellness of body, mind, and spirit. Register for one or more 8-week classes as a series. Mondays,	February 4-March 25, 6-7 p.m.
Mondays,	April 1-May 20,	6-7 p.m.
Winter is the perfect time to bring Hygge (pronounced hue-guh) into your life! 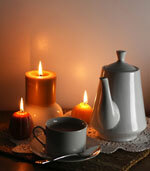 Learn about the Danish concept of well-being and coziness, and how you can apply it to all aspects of your life. Make yourself a priority this winter by embracing yourself, setting goals, and incorporating the warm and cozy lifestyle of Hygge. Wednesday,	February 6,	6:30-8 p.m.
During this fun, experiential class, you will be introduced to a wide variety of herbs used for topical application. 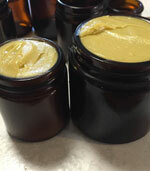 Learn about the herbs and recipes, and then make your own infused oil, salve, and lotion to take home. Recipes and all supplies provided. Sunday,	March 24,	10 a.m.- 4 p.m.
Spring shoots, buds, and tender greens will enliven all your senses as we identify, craft, and 'put up' wild plants for food and medicine. This class will inspire both the novice and experienced forager as we discuss the season's plants and make several nourishing and medicinal preparations. You will go home with resources and samplings from class. All supplies provided. Sunday,	May 5,	9:30 a.m.-4:30 p.m. Engage your senses, discover hidden talents, learn a new technique, and explore a more personal relationship with plants and nature. From gardening practices to using nature as inspiration for the arts and do-it-yourself projects, Olbrich Botanical Gardens offers a broad range of classes and programs for adults. Led by experts in their fields, our programs provide something for every interest and skill level. Visit Olbrich Botanical Gardens to explore the wonder of plants, gardening, and the natural world. Limited space; register early and by the deadline. Make a one-of-a-kind piece of fiber art for your backyard feathered friends or a bird lover. 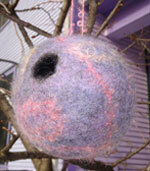 Learn the art of felt making using wool roving to create a shape around a resist. Bird pods are soft in appearance, but durable enough to stand up to outdoor use. No experience necessary. Felting tools and fibers provided to make one bird pod; bring three towels. 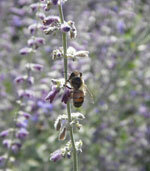 Sunday,	January 27,	9 a.m.-12 p.m.
Sunday,	January 27,	1-4 p.m.
What does your garden look like from a bee's perspective? Understand how bees see flowers, and learn basic bee garden design and bee-friendly gardening practices that will make your garden a bee haven. This lecture will leave you buzzing with excitement! Wednesday,	February 6,	6-7:30 p.m.
Every day in Olbrich's outdoor gardens is different, and the loveliest garden moments are often fleeting. During this inspirational presentation, hear about a "grab bag" of favorite plants, techniques, and garden experiences from 2018 at Olbrich and other gardens. 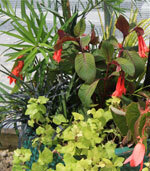 Thursday,	February 7,	6:30-8 p.m.
Do you have limited space in your garden and need narrow-growing plant options? Learn about the many diverse plants that tend to be narrow or dwarf, as well as other new plant options for small spaces. Tuesday,	February 12,	6:30-8 p.m. If winter leaves you itching to get planting, but you cannot afford a greenhouse, then this class will give you the basics on getting started with LED technology for under $100. 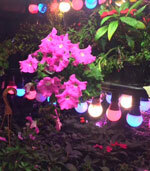 Learn how to grow ornamental plants using off-the-shelf products, and how to set up a LED system. A system supply list will be shared. Tuesday,	February 12,	6:30-8:30 p.m.
Wednesday,	February 27,	6:30-8:30 p.m. Double knitting has been around for centuries and is experiencing a current resurgence. Learn the 'inside out' version in this workshop. Emphasis will be on the terminology and how-to techniques, including increasing and decreasing, to help you make a cowl or headband. Supply List provided. You need to know how to cast on, knit, purl, and join in a circle. Saturday,	February 16,	1-3 p.m.
Anderson Japanese Gardens, located in Rockford, IL, is a beautiful, twelve-acre landscape that inspires the mind and energizes the soul. Hear about the design process, engineering, and construction of two iconic pieces of this public garden - the monumental 50' waterfall and the 16th-century-style tea house. Monday,	February 18,	6:30-8 p.m. 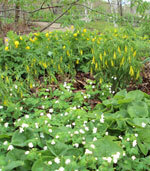 Starting seedlings for a Wisconsin native garden requires little cost or space. Hear about various native plants that provide interest in your garden from spring through fall, and learn how to grow seedlings on your window sill. 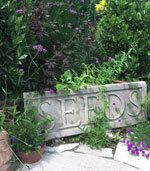 You will plant three small seed trays with various native seeds to nuture at home. Thursday,	February 21,	6:30-8:30 p.m. 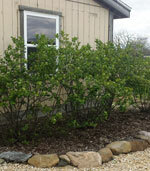 Explore the exciting possibilities of native shrubs in your landscape. Learn easy-to-follow tips about native shrub selection, placement, and maintenance. Expect to discover the environmental and economic benefits of native shrubs and how these beautiful, low-maintenance plants can be used in your landscape for both aesthetic appeal and functional purposes. Tuesday,	February 26,	6:30-8 p.m.
After a most challenging year of rain, learn how to keep your basement and garden safe and dry. 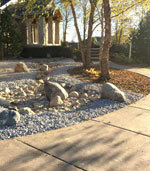 We will discuss grading and drainage, along with rain garden placement and plants. Thursday,	February 28,	6:30-8 p.m. 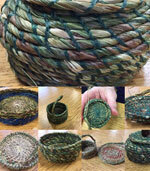 Learn to make a sweet grass basket, using the coiling and stitching technique, and explore other materials that can be added to your basket design. How to grow sweet grass will be included, along with making a sweet grass braid to take home. Most supplies included; a supplies list provided. Saturday,	March 2,	9:30 a.m.-4:30 p.m. In this style of knitting the yarn is tensioned around a knitting pin on your shoulder or around your neck. 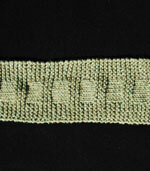 Stitches are created by a flick of your thumb, making this an easy way to knit without stressing your hands or wrists. Learn the techniques of Portuguese-style knitting as you make a scarf. Supply List, Portuguese Knitting Pin, and instructions provided. 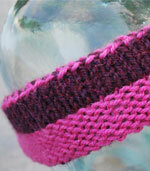 Knowing how to cast on, knit, purl, and bind off are helpful. 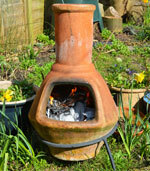 Saturday,	March 2,	1-3 p.m.
Fire can be a wonderful element to add to almost any garden. Learn how to create a safe, aesthetically pleasing outdoor space as we explore style, function, codes, sizing, and even psychology of fire elements. Tuesday,	March 5,	6:30-8 p.m. The growing season goes by too fast to remember all the details of your garden, which is why keeping journals and records can help. Learn the basics of garden journaling and plant record keeping, along with special tips and tricks from home gardeners and horticulturists. The Home Creamery: Cheese Making and More! Learn to make cultured butter, yogurt, and cheese at home. This class combines discussion with demonstrations and hands-on experiences of making cultured milk products and several varieties of cheese, including feta and mozzarella. All supplies included. Saturday,	March 9,	9 a.m.- 4 p.m.
A departure from the more formal calligraphy lettering, try this playful approach to letterforms. Explore markers, paints, colored pencils, doodling, and more. Learn fun and funky styles using block letters, stencils, stamps, and your handwriting that can add a new twist to your garden journals. No experience necessary. Some supplies included; a complete Supply List provided. Saturday,	March 9,	1-4 p.m.
One of the most important aspects of home ownership is proper drainage away from your house and the elimination of standing water. Wisconsin building codes will be discussed plus the use of rubber membranes, drain tile, catch basins, rain gardens, and erosion control measures to protect your home from water. Tuesday,	March 12,	6:30-8 p.m. 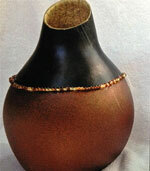 Using a prepared gourd, create a beautiful vase with a stone-like finish and embellished with feathers, beads, or paint. A selection of finishes will be available, and the project will be completed in class. No experience necessary. All supplies provided. Wednesday,	March 13,	6-8:30 p.m.
North, South, East, and West, Jesiolowski has traveled across the country on a quest for stunning horticultural finds. From the crapemyrtles of the Carolinas to the cacti of the Sonoran Desert, this presentation will highlight the most inspirational gardens and plants he has encountered in the Midwest and beyond. Saturday,	March 16,	1:30-3 p.m. 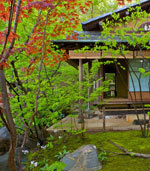 Preventing a wet basement begins by managing the water outside and in the landscape. This presentation will show you how. Learn creative and functional landscape solutions that are key to keeping your basement dry. Starting with our outside/in and top/down approach, you will leave you with long-term solutions to a potentially 'knee deep' problem. 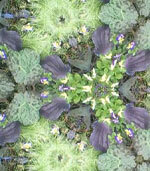 Tuesday,	March 19,	6:30-8 p.m.
IS YOUR ECOSYSTEM MAXIMIZING YOUR HEALTH? We've all heard the saying 'you are what you eat,' but with food being sourced across the world, the need to know exactly what you eat is important. 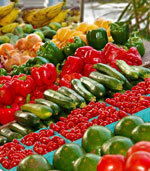 Explore how your environment and the environment of your food can improve or deter health. You will develop a plan that guides the decision process for the foods you eat. Thursday,	March 21,	6:30-8:30 p.m.
Do you wish your ornamental crabapple tree had large juicy apples? Do you have a fruiting apple tree but wish you had a crabapple tree? These are just some reasons to practice the age-old art of grafting. 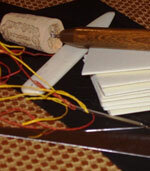 Learn several approaches to grafting, followed by a demonstration and hands-on practice. 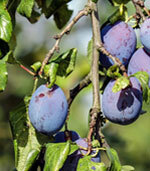 You will graft and take home two semi-dwarf fruit trees of your choice (apple, pear, or plum). Root stocks and scionwood provided. Saturday,	March 23,	1-3 p.m.
Join fellow fruit tree enthusiasts as we swap stories and trade scionwood from various fruit trees. 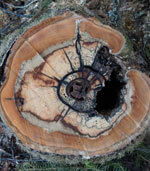 Bring as many types of labeled cuttings of dormant scionwood as you wish; no patented varieties. If you are picking up scionwood, bring plastic bags. If you are bringing scionwood to trade or give away, be ready to supply a botanical name and description of the fruit. Saturday,	March 23,	3-4 p.m. 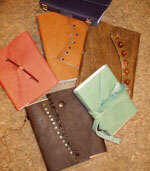 Create a multiple signature book using heavy paper, decorative fabric, or colored leather for your wrapped cover. 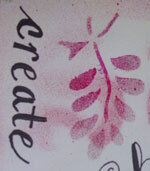 Add a choice of closure techniques and personal embellishments to finish your book. Most supplies included; a complete Supply List provided. No experience necessary. 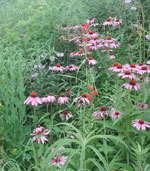 Saturday,	March 23,	10 a.m.- 4 p.m.
Plant a small section of your yard as a native prairie! Learn step-by-step selection and preparation of a site, selection and planting of seeds, what to expect in the first few years, and maintenance of the prairie. Seed sources, tips, and techniques will be shared in the presentation. Monday,	March 25,	6:30-8 p.m.
Tuesday,	March 26,	6:30-8:30 p.m. The ultimate goal is a healthy, fertile, biologically active soil with improved structure and enhanced nutrient availability. We will examine the structure and composition of soil, along with techniques for maintaining soil health and fertility. Instruction and materials on soil testing, sampling, and interpreting the results will also be shared. Wednesday,	March 27,	6:30-8 p.m.
Perennial garden colors and forms are dynamic, which results in a dynamic garden maintenance program. 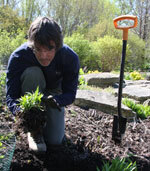 Pinching, cutting back, dividing, and other gardening tasks are all done at different times throughout the seasons. 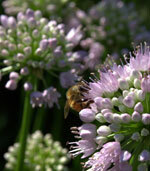 Learn how to make your perennial garden easier to maintain through design and plantings. Thursday,	April 4,	6:30-8 p.m. 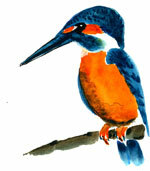 Explore different Chinese brush painting techniques to create various birds: rooster, hen and chicks, eagle with pine a tree, kingfisher with a lotus, and more. Also learn the calligraphy for each subject. For beginners to advanced students. Supply List provided; bring a bag lunch. 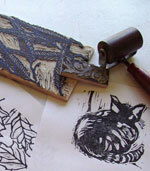 An optional supply kit ($25) can be reserved by calling (608)245-3648 and paid for the day of the workshop. Sunday,	April 7,	9 a.m. - 5 p.m.
Fun foam, linoleum, erasers, yarn, rubber bands, and add a few common household items to re-use or recycle as you create designs for printing. Use flowers, plants, or personal images as inspiration or subject matter to make cards and wrapping papers in this fun 2-week workshop. All supplies included. Tuesdays,	April 9 & 16,	6-9 p.m.
African violets offer a wealth of beautiful flowers and can be grown successfully on window sills. Learn how to be successful, including how to start from a leaf, soil and fertilizer types, care and growing conditons, rejuvenating violets, dividing and transplanting, and much more. 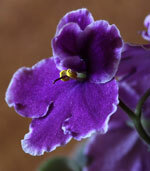 Each paid participant will receive one African violet starter leaf with instructions to take home. Thursday,	April 18,	6:30-8:30 p.m. 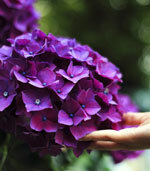 Known for the long-lasting, colorful summer blooms, hydrangeas are some of the most beloved shrubs in the plant kingdom. Hear about the '"ins and outs" of old favorites like 'Annabelle' to new selections such as 'Incrediball,' along with a few plants that are closely related to Hydrangeas. Cultural requirements and proper pruning techniques for each species included. Saturday,	April 20,	1:30-3 p.m.
Tuesday,	April 23,	6:30-8 p.m.
Wednesday,	April 24,	6:30-9 p.m. Most gardeners are aware of the problems caused by weeds, but there are readily available to buy garden plants that have the potential to become a nuisance. Learn about the 'thug' plants that, once established and given the right growing conditions, can quickly get out of hand in your garden. Thursday,	April 25,	6:30-8 p.m. Learn about basic and advanced composting techniques, uses, and tools that will help turn your yard trimmings and household waste into soil amendment "gold." 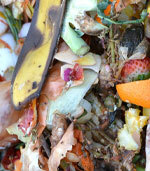 Composting over the winter, dealing with common problems, and what to do with your "gold" once it's finished will be discussed along with other tips. Thursday,	April 25,	6:30-8:30 p.m.
Do you have a challenging yard that is better suited for goats than humans? 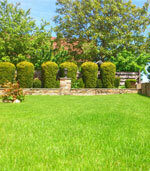 Is your lawn unsafe to mow due to the steep slope? Reclaim lost ground and turn a frustrating slope into a dramatic asset with various options and materials discussed to solve your difficult landscape slope problems. Tuesday,	April 30,	6:30-8 p.m. Learn about how tree injuries, undesirable growth characteristics, diseases, and insects can compromise the health and structural integrity of a tree. Gauge the potential seriousness of a defect and learn how to correct it. 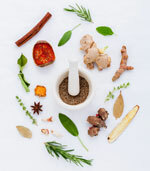 Wednesday,	May 1,	6:30-8 p.m.
Are you looking for an easy way to "spice" up your cooking? Discover the basics of herb gardening, from choosing the right plant for the right purpose to adding their vibrant flavors and aromas to culinary dishes. 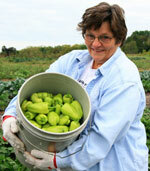 Learn methods and tips for planting, caring for, harvesting, and preserving these plants. Explore the different uses for fresh versus dried herbs and the science and magic of companion planting. Thursday,	May 2,	6:30-8:30 p.m. Learn the basics of bookmaking as you develop a portfolio of book structures to use for journals, gifts, and more. Explore various ideas, materials, and structures while learning basic sewing and gluing techniques. Develop a foundation for more advanced book structures through this 2-week workshop. All supplies provided. No experience necessary. 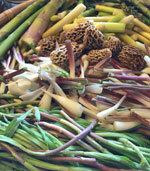 Wednesdays,	May 8 & 22,	6-9 p.m.
Get fresh garden salads without the garden! Learn how to plant and harvest lettuce, spinach, beets, and herbs in a 'salad bowl.' Create your easy to care for container garden, while sampling and learning about herbal vinegars to make at home when your salad is ready to harvest. All supplies and recipes provided. Thursday,	May 9,	6:30-8 p.m. 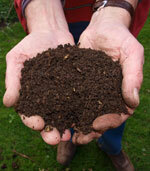 Successful gardening is dependent to a great extent on the quality and condition of the soil. Learn about some of the basic properties, physical structure, and living organisms in soil to help you better monitor and manage the soil conditions. Tuesday,	May 14,	6:30-8 p.m. Using perennial and annual plants, hummingbird feeders, and more, you can discover the magic and excitement of hummingbirds! 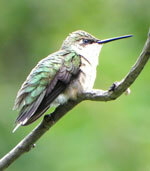 We will discuss identification of the ruby-throated hummingbird, ideal habitat, migration, nesting, feeding, importance of water features, and how the elements of the best hummingbird feeders and plants can bring you up close to these special birds. Thursday,	May 16,	6:30-8:30 p.m. Loved by small and large space gardeners alike, containers are a fabulous way to dress up your patio, deck, or balcony. 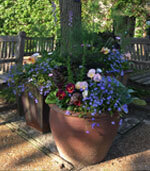 In this presentation and workshop, you will learn how to plant containers with overflowing beauty and go home with one finished 16" ornamental container. Upon registration, please indicate whether you prefer sun or shade plants. All supplies provided. Thursday,	May 23,	6-8 p.m. This hands-on workshop is for beginners interested in bonsai, the centuries-old Asiatic art of dwarfing trees and shrubs grown in pots or small spaces. Learn the basics of bonsai care and culture and techniques for designing and maintaining these sculptured treasures. 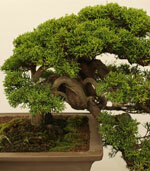 Using a Juniper, you will design your own bonsai to take home. Juniper, soil, and wire provided. Bring a small bonsai-style pot (6") or take your living sculpture home in a plastic pot. Thursday,	May 30,	6:30-8:30 p.m. 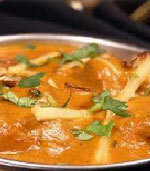 Learn how to create simple, easy, and delicious recipes using fresh ingredients and fragrant spices. Huma Siddiqui uses her culinary knowledge from her journey through four continents to bring a fusion style of flavors from her home land in Pakistan. Classes are demo-style with tasting of dishes by class participants and recipes to take home. Each participant pays registration fee in an adult/youth pair. Thursday,	March 7,	6:30-8 p.m.
Thursday,	April 11,	6:30-8 p.m.
Thursday,	April 18,	6:30-8 p.m.
What is an arrangement of shapes or forms in a repeated pattern without gaps that do not overlap? Tessellations are found in everyday objects like quilts, soccer balls, the tile floor in your bathroom, pinwheel toys, and can be seen when you LOOK through a kaleidoscope. These complex patterns also occur in nature: honeycombs, snake skins, and dragonfly wings are all tessellations. By LOOKing through a microscope, tessellations can also be found in a plant's vascular structure, the tissues that conduct water, sap, and nutrients. LOOK: Tropical Tessellations, a special exhibit in Olbrich's tropical Bolz Conservatory, features art installations displaying both human-made and natural tessellations created by local artists, Peter Krsko and Robert Anderson. Explore Olbrich's LOOK: Tropical Tessellations with artist Peter Krsko during these exclusive guided walks. 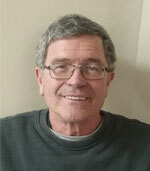 He will discuss his working methods, as well as the sources of and inspirations for his work, during a stroll through the Bolz Conservatory exhibit. Guided walks occur when LOOK is not open to the public. Meet in the Visitor Center Lobby. Limited space; register early and by the deadline. Thursday,	February 28,	6-7 p.m.
Thursday,	March 7,	9-10 a.m.
Saturday,	March 16,	4-5 p.m.
Tessellations are arrangements of shapes or forms fitting closely together without any gaps. Explore LOOK: Tropical Tessellations and a variety of flora tessellations with artist Peter Krsko. While observing the natural tiling and packing arrangements, an emphasis will be put on hands-on experience by building models of plant tissues and Krsko's sculptures. This play will also introduce you to the scientific concepts of tessellations and how they influence modern design and engineering. All supplies included. Join 702WI and Olbrich Botanical Gardens for Meet The Author. Michael Edmonds, Director of Programs and Outreach at the Wisconsin Historical Society, will discuss his most recent book Taking Flight. 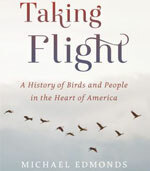 This book is a dynamic account of ornithological history in America's heartland. It explores how and why people have worshipped, studied, and protected the birds surrounding them. A book signing follows the presentation, and books are available for purchase. Thursday,	March 14,	6:30-8 p.m.
702WI (WI = writer incubator) is a co-creative workspace for writers, creators, and designers to work. It is also an event space for authors and reading groups, and a gallery space for artists who incorporate writing and words. 702WI was created by Reading Group Choices, a company that recommends books for reading group discussion, and is based out of Madison. Join 702WI and Olbrich Botanical Gardens for Meet The Author. 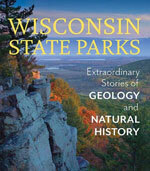 Hit the trail for a dramatic look at Wisconsin's geologic past with Wisconsin State Parks: Extraordinary Stories of Geology and Natural Histor. Freelance science writer Scott Spoolman takes readers with him to twenty-eight parks, forests, and natural areas where evidence of the state's striking geologic and natural history is on display. A book signing follows the presentation, and books are available for purchase. Speaker introduction by Melanie McManus, author of Thousand-Miler: Adventures Hiking the Ice Age Trail. Wednesday,	May 15,	6:30-8 p.m. 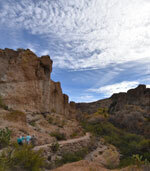 Explore the wonder of the natural world with your family. Learn & Play Together classes are a great opportunity for parents or caregivers to spend quality time with their children. Classes are designed for you to explore nature-themed topics side-by-side with your child as they engage in hands-on, fun, age-appropriate experiences. 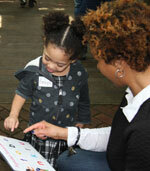 Children must be accompanied by an adult; limit two age-appropriate children per adult; adult attends free. Dress for the activity and weather. Limited space; register early and by the deadline. Bundle up and take a fun, guided winter walk through the outdoor gardens as we search for signs of animals living in the crisp winter temperatures. Class includes an outdoor guided walk, hands-on activities focused on learning about the different ways animals create optimal habitats during our cold Wisconsin winters, and a take-home activity. Ages 5-11 with an adult. Saturday,	January 26,	9:30-11 a.m. Create your own magical land and simple creatures to live and play there. 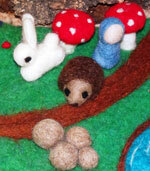 We will use needle felting to create a small playscape on a piece of fabric. You decide how it will look - a magic pond, mushroom chairs, a small bridge, flower covered hills - the possibilities are endless. After learning the basics of needle felting, you will create small creatures to inhabit your new land - hedgehogs, bunnies, and maybe even a gnome child. All supplies provided. Class fee includes one child/adult pair. Ages 8 and up with an adult. Sunday,	March 3,	1-2:30 p.m. The rainforest is a noisy place! Through squeals, hisses, grunts, howls, and songs, the creatures of the rainforest are constantly communicating. In this nighttime class, we will explore the different sounds of the rainforest through a guided after-hours tour in the Bolz Conservatory and other hands-on activities. Ages 5-11 with an adult. 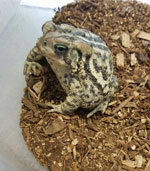 Friday,	March 8,	6:30-8 p.m.
Have you ever wondered what the differences are between frogs and toads? Or wanted to learn about the weird and wacky ways many species have developed to successfully live and reproduce? Join the Madison Area Herpetological Society to learn about and see frogs and toads, including some that are truly bizarre! Ages 7-12 with an adult. Friday,	March 29,	6-7 p.m.
Join us for mythical garden creature fun! Learn the myth and lore of gnomes, rock trolls, flower fairies, and nymphs, search for signs of these mythical creatures, and make your own garden creature and small garden house to take home. All supplies provided. Ages 5-11 with an adult. Friday,	April 26,	6:30-8 p.m. 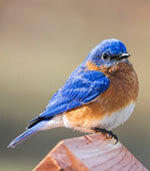 Learn how to attract Eastern bluebirds, tree swallows, house wrens, and black-capped chickadees to your yard. 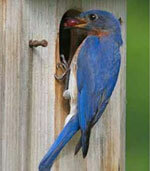 Habitat needs, along with nest box size and placement, will be discussed. You will assemble a nest box from a provided kit to take home. Bring a Phillips screwdriver. Class fee includes one child/adult pair. Ages 12 and up with an adult. Wednesday,	May 8,	6:30-8 p.m.
Little Sprouts programs are nature and literature-based early childhood programs designed to meet the multidimensional learning and developmental needs of our Little Sprout audience, children ages 2-5 years. Each class is designed for children to work side-by-side with their adult caregiver as they engage in hands-on, fun, age-appropriate experiences that support the Wisconsin Model Early Learning Standards. In addition to Little Sprouts Story & Strolls, watch for other upcoming programing for 2-5 year olds, like Little Sprouts Gardening classes, in next semester's class catalog. Saturday,	December 1,	10-11 a.m.
Friday,	December 7,	10-11 a.m.
Saturday,	December 8,	10-11 a.m.
Friday,	December 14,	10-11 a.m.
Saturday,	December 15,	10-11 a.m.
Friday,	December 21,	10-11 a.m.
Friday,	January 11,	10-11 a.m.
Tuesday,	January 15,	10-11 a.m.
Friday,	January 18,	10-11 a.m.
Tuesday,	January 22,	10-11 a.m.
Friday,	January 25,	10-11 a.m.
Tuesday,	January 29,	10-11 a.m.
Friday,	February 15,	10-11 a.m.
Friday,	February 22,	10-11 a.m.
Friday,	March 8,	10-11 a.m.
Tuesday,	March 12,	10-11 a.m.
Tuesday,	March 19,	10-11 a.m.
Friday,	March 22,	10-11 a.m.
Tuesday,	March 26,	10-11 a.m.
Friday,	March 29,	10-11 a.m.
Friday,	April 5,	10-11 a.m.
Friday,	April 26,	10-11 a.m.
Friday,	May 3,	10-11 a.m.
Friday,	May 10,	10-11 a.m.
Olbrich Botanical Gardens is the perfect place to explore the wonders of nature. Scout and youth groups are invited to join us for self-guided visits or hands-on learning programs designed to engage youth with the world around them. Limited space; register early and by the deadline. To register a group or individual youth for a self-guided visit or program, contact the Education Department by calling (608)245-3648. Plants are incredible organisms! Join us as we explore the amazing world of plants and gardening. Participants will investigate connections between insects, flowers, and soil through hands-on science explorations like flower dissections, composting activities, and seed observations. 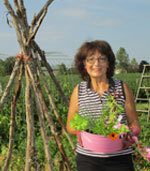 As a way to take what you have learned with you, participants will also create a mini-garden to take home! All supplies provided. 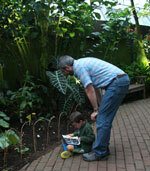 Saturday,	March 16,	9:30-11 a.m.
Do mythical garden creatures live at Olbrich Botanical Gardens? Let's find out together! Join us as we explore the myth and lore of gnomes, rock trolls, flower fairies, and nymphs through storytelling and story sharing. Participants will also search for signs of these mythical creatures living at Olbrich Botanical Gardens and make a garden creature and small garden house to take home! All supplies provided. Saturday,	April 27,	9:30-11 a.m. The Greater Madison Writing Project, in partnership with Olbrich Botanical Gardens, hosts workshops and camps for young writers (those entering grades 3-8) and high school writers (those entering grades 9-12). 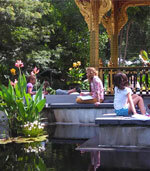 Participants write in a beautiful environment using Olbrich's outdoor gardens and tropical conservatory as inspiration. The supportive environment is led by a staff of Greater Madison Writing Project Fellows and experienced teachers of writing whose goal is to inspire and support writers of all abilities. Limited space; register early and by the deadline. To learn more and to register, visit go.wisc.edu/gmwpyouth. Email questions about Youth Writing Programs to mdziedzic@wisc.edu. 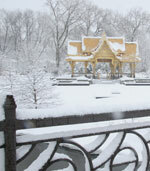 Explore a side of Olbrich Botanical Gardens that many people never experience - the gardens in wintertime! After a tour of the outdoor gardens (dress for the weather), we will use the hibernating winter world as inspiration when we head indoors and play around with different forms of creative writing. 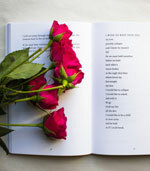 Saturday,	January 26,	9 a.m.-12 p.m.
April is National Poetry Month, so help us celebrate poetry! 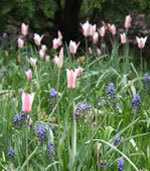 We will start the workshop by exploring the outdoor gardens in springtime (dress for the weather). After getting lots of inspiration outside, we will head indoors to experiment with different types of poetry. We'll try diamante poems and laugh at our "never" poems. We'll learn new types of poetry and "find" some poems, too! Saturday,	April 6,	9 a.m.-12 p.m. 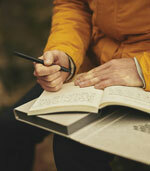 Participants will write daily in a beautiful environment. At the end of each camp, young writers will share their favorite pieces of writing from the week for their families and friends at an evening celebration. Each participant will contribute a piece of writing to be published in an anthology; each participant receives a copy. Early Bird registration before May 1 is $200 per youth. After May 1, registration is $250 per youth. Monday-Thursday,	June 24-27, 9 a.m.-2 p.m.
Monday-Thursday,	August 5-8, 9 a.m.-2 p.m.
Monday-Thursday,	August 12-15, 9 a.m.-2 p.m.